Artichokes are fun to eat! After all, it’s another food that you get to dip into something delicious! 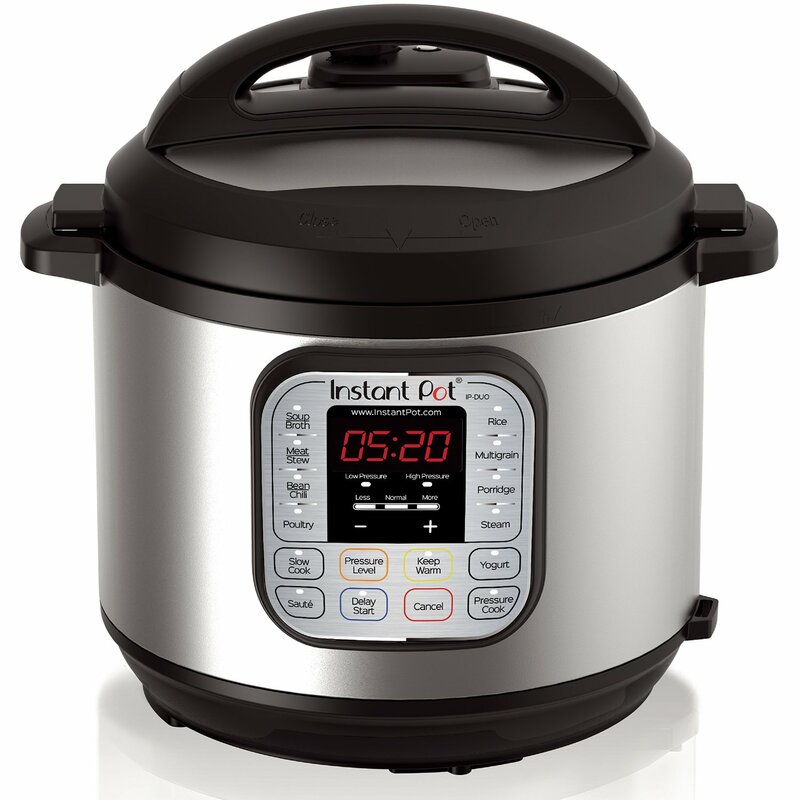 They take a while to cook, so I popped a couple into my Instant Pot to see how they came out. They were great, and done in a fraction of the time than on the stove top! So now I make Instant Pot Whole Steamed Artichokes whenever I crave one. 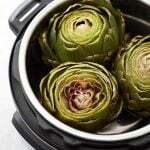 These pressure cooker artichokes couldn’t be easier to make. Get your favorite dipping sauce ready, because you will want to make these! I remember the first time I saw someone eating an artichoke. It was in the fifth grade at lunch. The teacher was eating her lunch at her desk, and a student was sitting with her eating the weirdest thing I had ever seen. They were dipping leaves into some white stuff and sucking it off (so it appeared to me) and discarding the leaves. Weird. All I could think was that whatever they were eating, I wanted to find out what it was, and try it for myself. I guess I’ve always been adventurous with food. I can tell you that for all that my mom was a cook, she never once fed us an artichoke! I laugh just thinking about it! 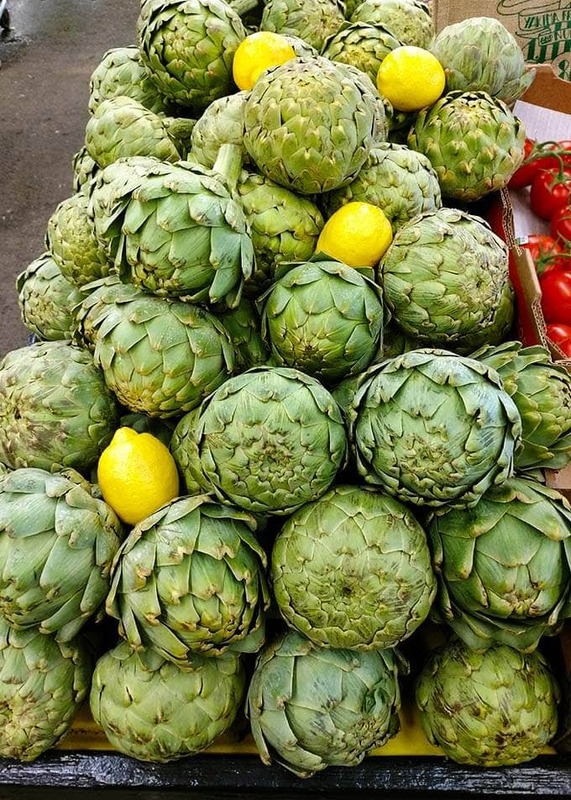 When you choose an artichoke, you will see that there are both loosely and more tightly packed leaves. There are also various sizes. It makes a difference in cook time, so try getting consistent size, and density of leaves when you are choosing your artichokes. 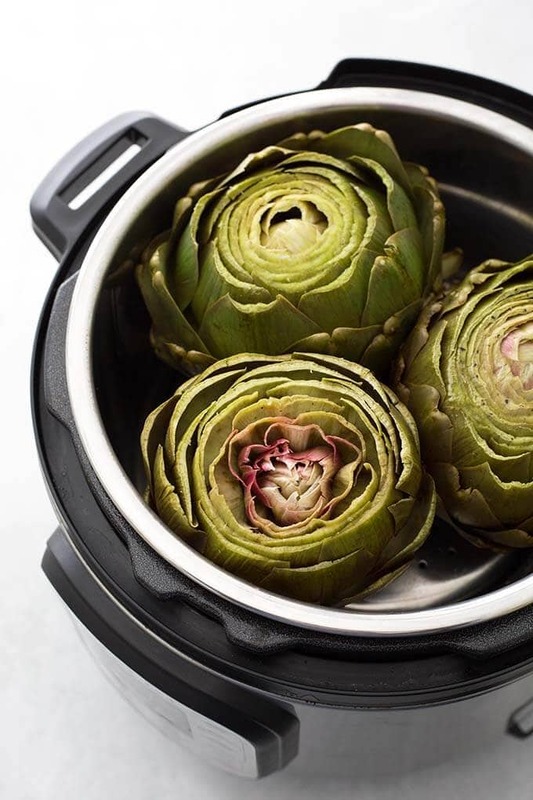 Larger and more tightly packed artichokes can take up to 20 minutes or more to cook in the Instant Pot. The smaller, less tightly packed artichokes take about 10 minutes to cook. Lemon Mayo – Mix some mayo and lemon juice together. Melted Butter – Melt butter in a microwave safe dish. Garlic Butter – Sauté a couple of pressed garlic cloves in butter. 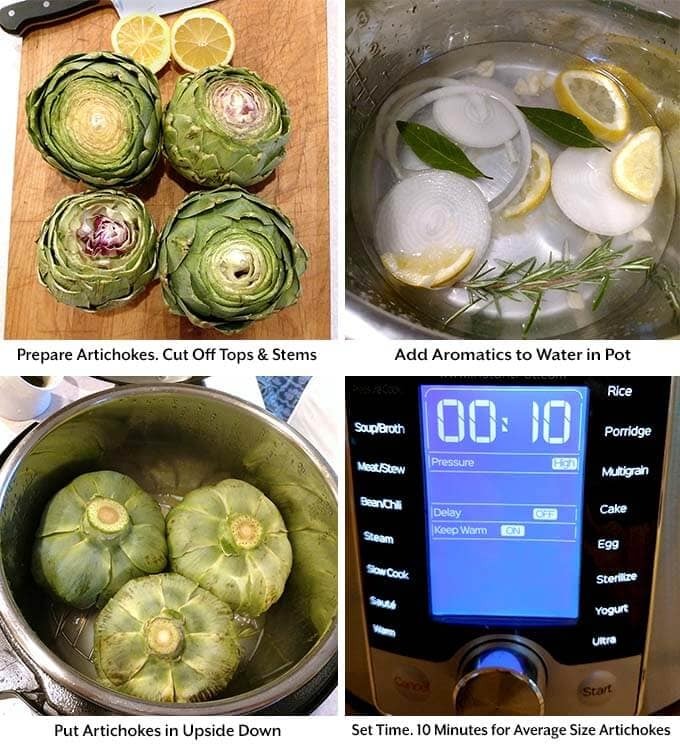 Instant Pot Whole Steamed Artichokes are a faster and easier way to cook artichokes. 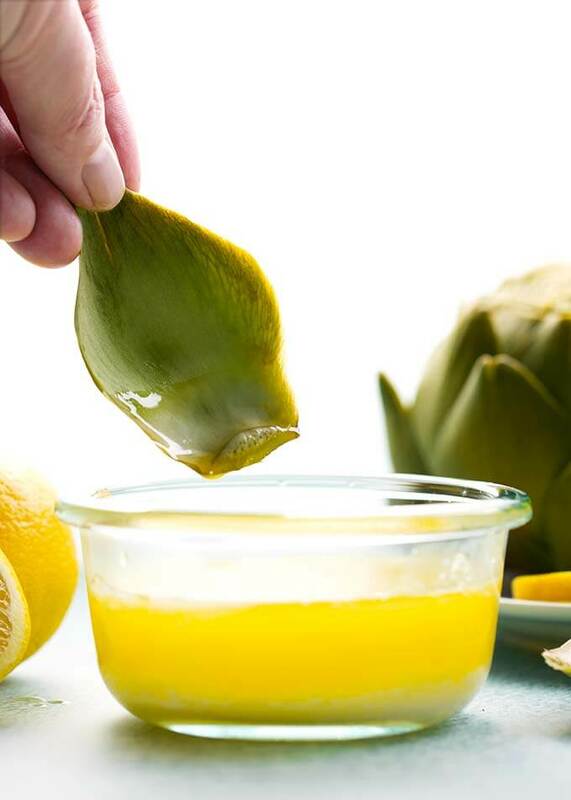 Pressure cooker artichokes are tender and ready to dip in your favorite sauce! Remove small outer leaves that are dry, and cut the stem off, leaving about 1/4". Then use a really sharp serrated knife to cut the top inch or two off of the artichoke. This exposes the inside and will allow the steam to penetrate it. Rinse the artichokes and pat dry with a paper towel. Then rub some lemon on the cut surface to prevent browning. 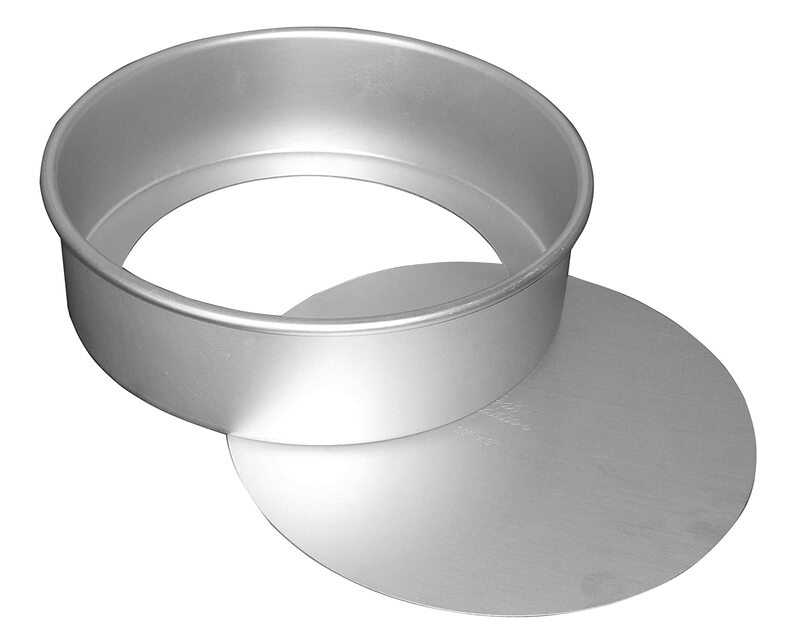 Add the water to the stainless inner liner. Then add the aromatics, if using, (garlic, bay leaves, lemon slices, salt, onion, and rosemary). Place the trivet/rack into the pot. Place the artichokes into the pot, stem side up (cut side down). Close the lid and set the steam release knob to the Sealing position. When the cooking cycle is finished, do a Quick Release of the steam/pressure by turning the steam release knob to the Venting position, or pushing the release button, if applicable. You can tell when the artichoke is done when a knife slides into the bottom easily. Lemon Mayo - Mix some mayo and lemon juice together. Melted Butter - Melt butter in a microwave safe dish. Garlic Butter - Sauté a couple of pressed garlic cloves in butter. 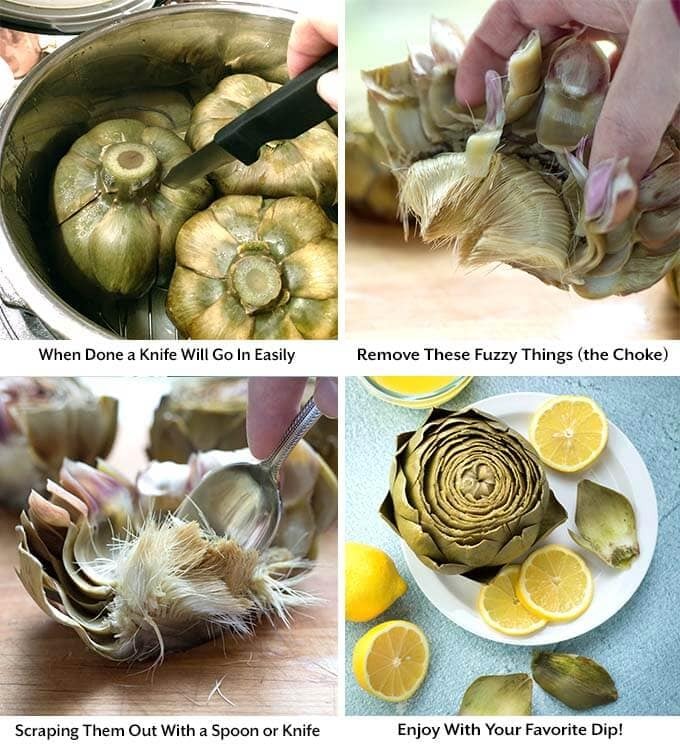 *Cook times will vary based on the size of the artichokes, as well as the density of the leaves. Tightly packed, denser quantity of leaves (and a heavier artichoke) will take longer to cook. You may need to do a test to find your perfect cook time. Great directions, especially the part about tightly versus loosely packed. I often do them to this step earlier in the day and then finish in the grill with whatever I’m grilling that night, using whatever dip I’ve made for them. Hi Anne! Thank you for the nice comment. Artichokes can be persnickety, I’ve had one or two just want to take forever to cook! But this method works for most! Love the idea of grilling them! We are SO CLOSE to grilling season! You guys never account for the time it takes to come up to pressure before the “cook” time! That has to figure in to total time,, Just sayin’! Hi Robert, in this recipe I did give 5 minutes for the pot to pressurize. I agree!! I couldn’t figure out why my meat wasn’t cooked in the time stated until I figured out the exact thing you are referring to!! Yes, you can cook just one. Same cook time as 2 or 3. Hpw do I pin this recipe? Thanks a lot for this great recipe! Glad to hear you share about your Mom. Too funny indeed. I don’t think my Mom know what an artichoke was. I grew up on artichokes. My Mom had them growing in our frontyard flowerbed. This is my 1st time making them in my instant pot. Thanks!